Social media marketing is no picnic, and most marketers have to try a lot of things to find the right niche and post schedule for their brands. Then, they have to come up with the right content for their audience, and that can be especially tricky. We like to show real life examples of companies, that are our clients, doing great things in social media. Today’s focus is on three brands who rocked Facebook in January. The are The Italian-American Page, GEX Management, and BellaSentials. Let’s take a look at some of their campaigns and understand what they’re doing so we can learn from their success! The Italian-American Page is a site designed as a place for people to discuss their Italian culture and connect Italian Americans on Facebook. They post relevant, funny content that surprises and delights their fans and followers. Founded in 2008, the page has 61,946 likes and tons of engagement. As you can see, this page is all about engaging with their community and making Facebook fun. 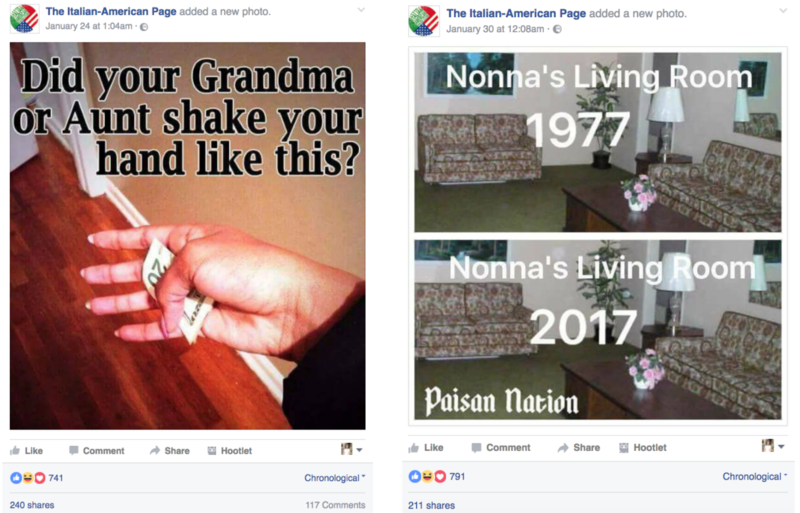 While you might not have the opportunity to post solely humourous content, all brands can take a lesson from the Italian-American Page to prove that engagement and hyper-relevant content always wins the Facebook game. We talked to Daniel Casciato, a freelance writer, ghostwriter, social media coach, and blogger who specializes in content marketing. Q – According to your experience, what types of social media campaigns are most successful? A – We use Facebook primarily to create brand awareness. We post links to original articles we write on our site along with original photos and memes that our readers often share with us. We’ve been pleased that we have been getting some good organic reach. But occasionally we do use Facebook’s boosted posts to drive people to our website to read our articles. Even spending as little as $5.00 per post generates great results for us. Q – Do you have some monthly topics to post about on your Facebook page? A – We try to post a variety of topics including recipes for a variety of Italian food, family-related stories, and any photos or videos that our followers send us. We receive a lot of requests to post items but have to take time to sift through each message to make sure it’s appropriate for our page. As far as topics or themes, we do acknowledge Italian-American Heritage Month in October. So throughout the month, we’ll often write about Italian-American history. We’ll also post about family traditions in December as we get closer to Christmas. The Feast of the Seven Fishes is an important tradition that many Italian families still honor. So throughout December, we’ll write more posts related to this tradition. Q – You publish a lot of funny photos and facts about Italy. And this type of content receives a great number of likes and shares regularly! Where do you find inspiration? A – The founder of the site and I take time to do some research on facts about Italy that we feel is important to our readers. Our followers are important — without them, our online publication and the corresponding Facebook Page won’t be successful. So we post facts, photos and videos with their interests in mind. This is where a tool like PromoRepublic comes in handy as well. We always look at the daily calendar to see if there are any special days that might be of interest to our readers. For example, PromoRepublic lists celebrity birthdays. If we see that it’s Al Pacino’s birthday, we’ll create a post acknowledging his birthday and then link to a movie clip of his. We love the Made for You category in the Calendar which is customized around our page’s primary objectives. Of course, food and wine are popular among Italians so many of the Made for You templates feature creative recipe ideas and great wine-related memes. We also like the Trending template, especially for the holidays. For February, PromoRepublic has some nice Valentine’s Day templates that we can use as is — or adapt to our own. Although I have been managing social media channels for clients for years now, sometimes I struggle finding the right content to accompany a photo or meme. For many of the PromoRepublic post template ideas, the copy is already written for you. You can use it as is or modify the text for your page. The same goes for all of the images and templates—you can modify the images by adding your logo, changing the color contrast, adding other images or adding text to overlay on top of the image. You don’t have to be a graphic designer either—it’s very simple and easy to use. It certainly makes it easy for anyone who manages a social media page. Q – We would appreciate if you could share some social media tips and tricks with us! A – Listen to your audience. See how they react to each of your posts. And take a look at the analytics at least once a week. See how your followers reacted to your posts. Which posts fared well; which ones did not? Facebook does a great job with this and so does PromoRepublic. If you’re using PromoRepublic, check out the Statistics tab. In a tabular format, it will show us how many views and clicks each post received along with likes, shares and comments. This is useful information that any social media manager should be analyzing. Be sure to engage with your followers too. We have over 60,000 followers. The page continues to grow at a rapid pace not only because of the great content we post but because we engage with our followers. We respond to their messages to us promptly. We’ll address their questions in the comments section as quickly as possible as well. GEX Management is a company that provides technology and systems consultation to corporations. This is a very, very niche industry yet the page still has almost 8000 likes. While many consulting firms, especially technology-related ones, tend to post dry, long-form educational content, GEX Management manages to produce wildly effective and engaging content. They’ve engaged a social media firm, iSocialYou to help them run their social campaigns. 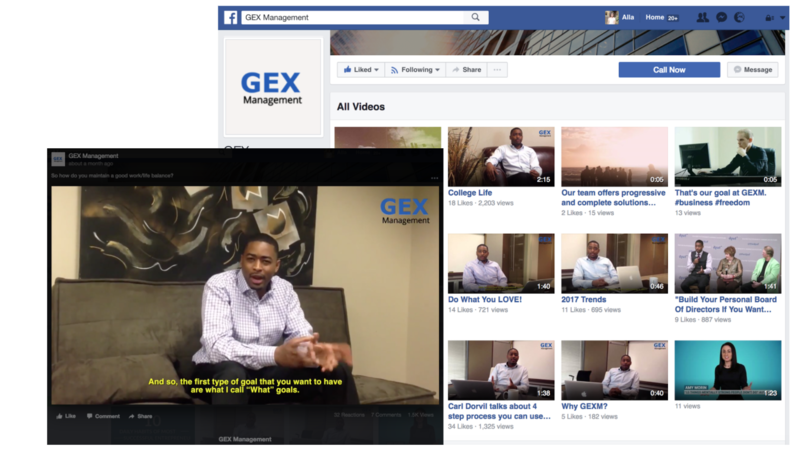 We were lucky enough to talk to the firm’s founder, Ali Mirza, about Facebook and social best practices and what works for his clients like GEX Management. We also talked to Ali Mirza is the CEO and founder of iSocialYou, a digital marketing agency. Q – Ali, what types of social media campaigns do you consider to be successful? A – Social media campaigns that drive engagement will always be more successful. Big brands like Starbucks and Bud light do a really good job of involving their fans in the social media campaigns. So instead of just “Enter to win” I would always prefer a campaign that creates native engagement with the fans. Q – What about a content calendar? Do you stick to it? A – Yes, we come up with monthly topics and themes for all of our clients. For every client, these topics are mainly driven by their industry and current events. For example, for our fashion clients, we are posting a lot about Valentine’s Day this month. For sports and media clients, our focus is on the Super Bowl. Thanks to PromoRepublic, posting killer visual content related to events and promotions is super easy. PromoRepublic is one of our go-to tools. You won’t believe how much time we save with this tool. Now with this calendar, we only need one tool. At iSocialYou, we use it on daily basis and my personal favorite is the “Trending” category. This is where you find compelling visual content related to current events. This content category is a perfect add on to our brand content. Q – You publish a lot of educational videos. And this type of content receives a great number of views regularly! Where do you find inspiration? 2017 is all about video and everyone should be looking to produce more video content. For our clients, we post two types of videos. 1 – We encourage our clients to produce short educational videos. I call these micro stories. For example, make a list of all the questions your target audience has about your business or industry. Then answer these questions in short micro videos. 2 – Look at the big players or influencers in your niche and syndicate their educational videos. For example, if your target audience is small medium business owners (B2B) then look at YouTube channels of Entrepreneur Media and Business Insider. A – Don’t treat social media as a “sales platform.” As users, we don’t go to social media to buy stuff. We go there for engagement, information, entertainment and education. I understand that, as business owners, we want sales from social media. But don’t forget what your potential customers are doing on these channels. Step1 (Attract) – You attract the RIGHT type of audience on your social media channels. Also keep in mind that youк engaged fans will convert much better and at a lower CPL (Cost per lead). BellaSentials creates essential oil diffusers that provide great aromatherapy benefits. Their Facebook page has 31,424 fans, which is great for a niche company, and their posts tell people how to use their products for the best possible benefit. 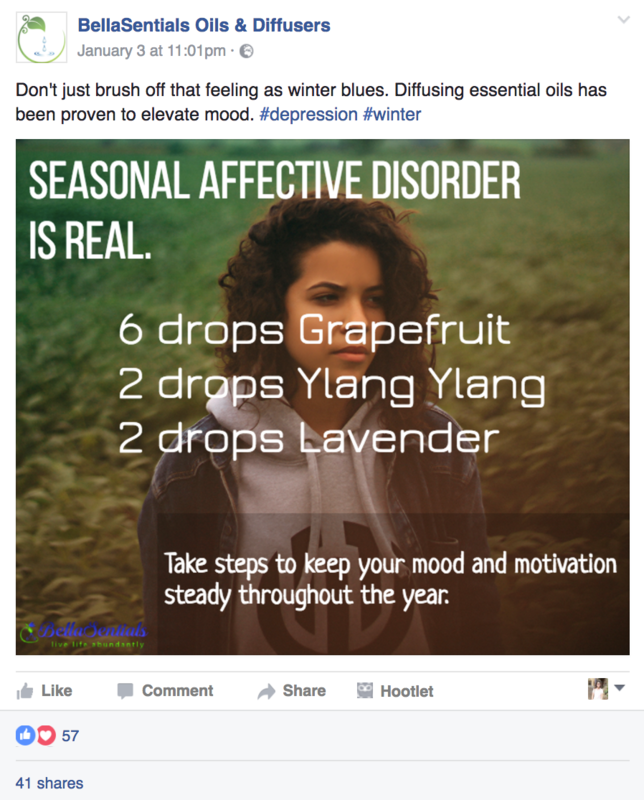 Take, for instance, their post on Seasonal Affective Disorder (SAD), a type of depression that is spurned by a change in the seasons. Most people experience it in the autumn and winter, SAD impacts anywhere between 4 and 20 percent of Americans over the age of 20. In their post, BellaSentials gives fans and followers a recipe to fight SAD. They use a stunning photo and offer a combination of essential oils that can lift one’s mood. They use appropriate hashtags (and not too many!) and they don’t write too much copy above their visual post. BellaSentials often posts great information about how their oils can help you fight a certain mood or ailment, or combinations of oils that can promote peace, meditation, concentration and energy. Their posts are visually appealing, don’t contain too much copy, but still get their point across beautifully. 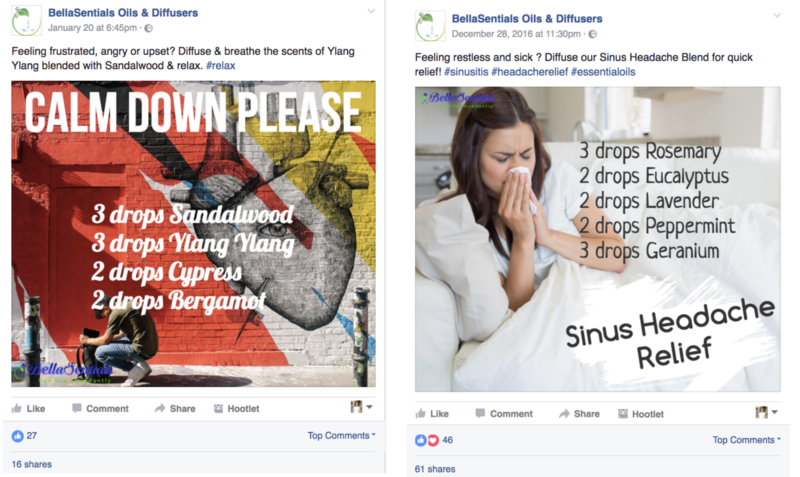 Cheers to BellaSentials for educating and helping their audience with visual content! Want to be featured in one of our Community pieces? Did you have a Facebook, Twitter, LinkedIn or Instagram campaign that went especially well? We want to hear about it! Email me at [email protected] and let’s talk!